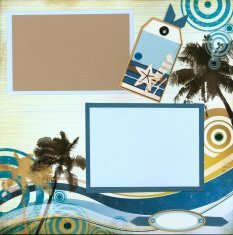 I have been researching Page Kits for Scrapbooking and recently discovered StoryTellers Club Scrapbook Kits. 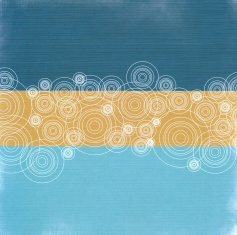 I purchased the Ultimate Pack for July 09 and was impressed with the contents and versatility of the kit. This Ultimate Kit I purchased for July contained 4 different and distinct themes, entitled At the Beach, 4th of July, Water, & Sweet Ambiance. Each theme included 4 - 12 x 12 sheets of double sided printed papers (lightly textured) and 2 or 3 sets of matching die cut & printed embellishments that were quite detailed and colorful. Also included were 12 solid sheets, 2 each of six colors, of Bazzill Card Stock to match the printed papers. 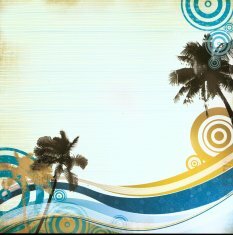 These are the "At The Beach" papers included with the StoryTellers Club Scrapbook Kit - front and back. 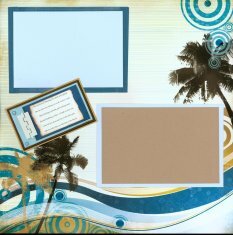 These are the Die Cut Embellishments for the At the Beach theme which include 12 inch border strips, titles, journaling boxes, tags in several sizes, photo corners and frames - more than enough to complete several 2 page layouts when combined with the solid card stock. Below are 4 of the layouts done using nothing but the items supplied in the kit. 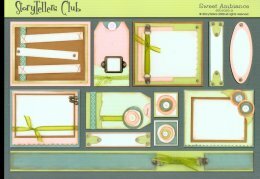 These StoryTellers Club Scrapbook Kit ideas are in addition to the Idea card supplied with each kit. There are still more embellishments available to use on additional layouts. The photo mattes here are double matted. 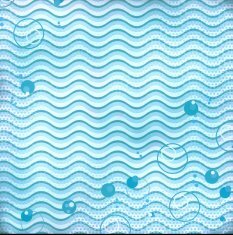 The self-adhesive Aqua colored "Droplets" are placed at the center of the circular designs on these pages and one is added to the tag. The tag is also accentuated with a blue brad and a paper ribbon scrap. Here the photos mattes are edged lightly with a brown "Slick Writer" that came with the kit. The 4 photo corners were used in a row to "point to" the Journaling Box instead of the traditional use on the corners of photos or mattes. 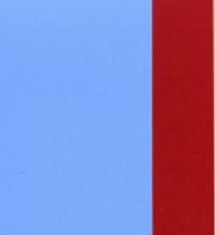 This 4th of July printed paper goes beautifully with the Blue & Red Solid Cardstock. 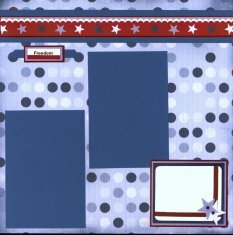 These are the Die Cut Embellishments for the 4th of July theme which includes 12 inch border strips, titles, journaling boxes, tags in several sizes, photo corners and frames - all in the popular red, white and blue primary colors. 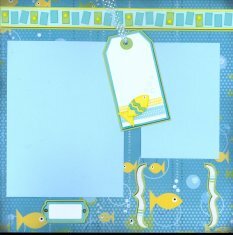 Combined with the printed paper and the solid cardstock, more than enough product from this part of the StoryTellers Club Scrapbook Kit to make at least 4 and probably even 6 nice layouts. Below are 2 layouts done using nothing but the items supplied in the kit. 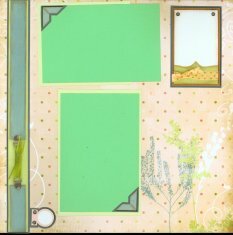 These layout ideas are in addition to the Idea card supplied with each kit and there are still more embellishment items and card stork to do additional layouts. 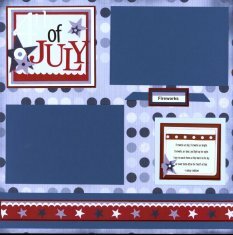 For these 2 July 4th layouts, 2 inch paper ribbon strips were cut as a background for the border stripes from the dark blue cardstock and 2 smaller 1/2 ribbon stripes were cut a backing for the the "Fireworks" and "Freedom" captions. What a great layout to use for your Fireworks photos. If the photos are not the same orientation (horizontal vs vertical) you can always turn the page 1/4 turn and re-attach the text boxes to accommodate your photos. These layouts will work either way. 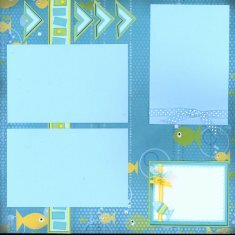 These are the Water printed papers included with the StoryTellers Club Scrapbook Kit - front and back. 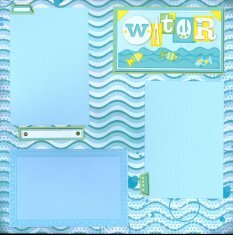 These are the Die Cut Embellishments for the Water theme which include 12 inch border strips, titles, journaling boxes, tags in several sizes, photo corners and frames - more than enough to complete several 2 page layouts when combined with the solid card stock. Below are 4 more finished layouts from this kit. 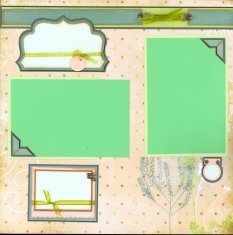 These layout ideas are in addition to the Idea card supplied with each StoryTellers Club Scrapbook Kit and there are still more embellishments and papers available to use on additional layouts. 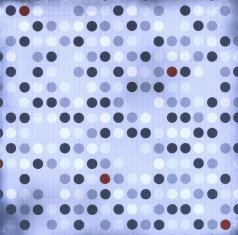 In these layouts, the light blue dotted ribbon was used on the the tags. 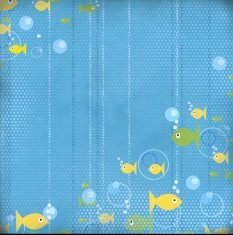 One of the mattes was cut very large 6 x 8 inches, to use for a 5 x 7 photo - perhaps for a great family photo of a trip to the beach or one of those photos they take when you go to one of our great Aquariums across the county. 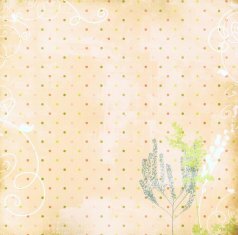 This is the beautiful and subtle "Sweet Ambiance" printed paper included with the StoryTellers Club Scrapbook Kit and goes beautifully with the Peach & Green Solid Cardstock. These are the Die Cut Embellishments for the Sweet Ambiance theme which include 12 inch border strips, titles, journaling boxes, tags in several sizes, photo corners and frames - more than enough to complete several 2 page layouts when combined with the solid card stock. And finally 2 more layouts. Here the photos are double matted with a green and yellow. 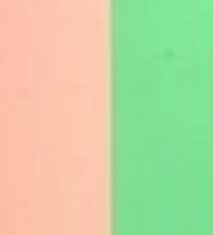 The photo corners were split up and used one to each matte. 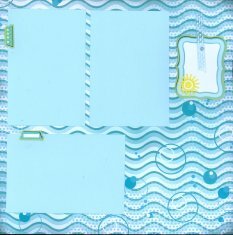 And if that was not enough in the Ultimate Kit, also included was an idea card showing 8 layouts, a sticker sheet with letters & words, 2 ribbon lengths, a clear acrylic sheet with printed frame, a scalloped edge chipboard frame, a set of 56 stickers called droplets in Aqua to go with the water themes, and an American Crafts Stick Writer in Black. All of this came in a heavy weight plastic zipperd Project Folder with eyelets to attach in a ringed binder. The ring binder forms into a Scrapbook Tote and comes free with a one year commitment. Also available is a smaller Kit, the Basic Pack which still has the 4 basic themes, 6 sheets of StoryTellers double sided heavy weight papers, 1 sheet of stickers, Idea card with 8 page layouts, and the Project Folder - a $30 value all for $16.95. It s hard to decide whether to make a commitment to purchase a monthly page kit, but StoryTellers does not require a monthly commitment.